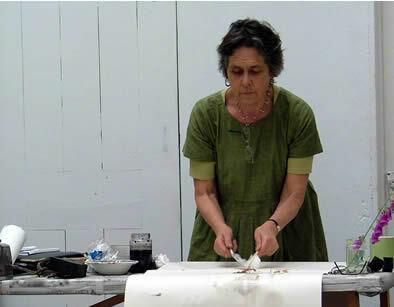 Meriel Gold (Hoare) has been painting and drawing all her life. She studied at the Slade School of Art in London, with Oscar Kokoshka in his School of Seeing in Salzburg and with Cecil Collins. What is also being offers here is a sense of intimacy, time, leisure and friendship while we explore the uncharted waters of creativity. We find the “stop” as our brush or hand touches the canvas or paper, like a kind of rest. It seems in this pause or rest that we are, as it were, drawn home into the quietness of ourself, which is what we are all really yearning for, and which infact, is always here, just waiting to be noticed.